Clinton’s probability of winning the general election hit a post-Labor Day high of 88% on 10/17, two days before the third debate. Since then it’s steadily declined and now stands at 68%. 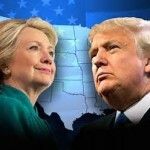 Were the election today, Clinton would probably receive 295 electoral votes and Trump 240. Trump would capture 45.5% of the popular vote and Clinton 48.5%. If the popular vote gap shrinks to two points, Trump’s chances improve substantially.